22 days ago I found myself in a rather anxious state. I was fraught with slivers of sadness and fretful with fits of frustration. I realized I was overwhelmed and so, so tired. Unable to disencumber myself from these loathsome sensitivities, I made a hasty retreat into the safety and security of my little bubble and tried to shield myself from however much of the world I could. It was my intent to settle into a soul soothing solace for a few days, but my melancholy managed itself into a moroseness I found difficult to soothe. Before long, I was floating through each day upon a virtual ocean of apathy. 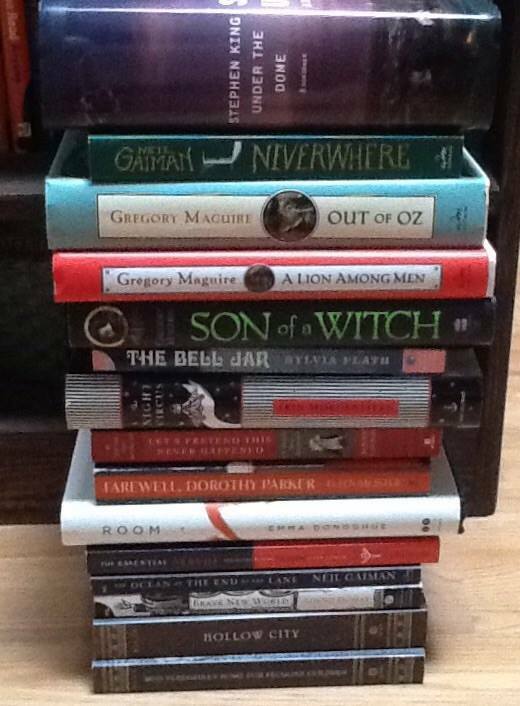 Reading was my only comfort, so I read page after page, book after book (15 of them), sequestering myself from just about everything – the computer, the phone, the kids, the husband, the laundry . . . I drank coffee and devoured words until one afternoon I finally felt the sun on my skin, heard the birds singing, and sensed a flutter of emotion stir in my heart. I’m not entirely certain what precipitated the gloomy shadow that tried to swallow me, nothing particularly unpleasant or dreadful occurred, there wasn’t some fantastical event that sent me spiraling downward into the depths of despair. I suppose it was simply life and the living of it. Sometimes we just need a break for a few days, or 22 as the case may be. The first 18 days were spent doing little else aside from thinking, reading, and avoiding human contact. I interacted as little as possible with everyone. I avoided any and all responsibilities I could possibly avoid. I just wanted to be alone. With my books. I sat on the porch with them from morning till night and then sat with them some more in my room until sleep would come. Somewhere in the middle of my madness, I received a blessing so lovely I saw stars, literally. I almost ignored the stack of mail the postman delivered, but I noticed the corner of an envelope peeking out between the bills I’d eventually have to deal with and it practically called out to me. I slipped it from the pile and was surprised to find it was hand addressed . . . to me. When I saw the postmark I couldn’t help but smile. It said Royal Mail and it had traveled a long way to bring me a smile. I opened the envelope carefully, I knew there would be more than lovely words inside, and when I opened the card, the sun twinkled off of the glittering stars that awaited me. It was the first real smile I’d smiled in a while. Before I could read the letter they adorned, I picked up the other prize that envelope held for me, a hand drawn ampersand. That was when the first tear fell. It was beautiful. One of the most precious gifts I’ve ever received. I stared at it with a mix of awe and thankfulness. 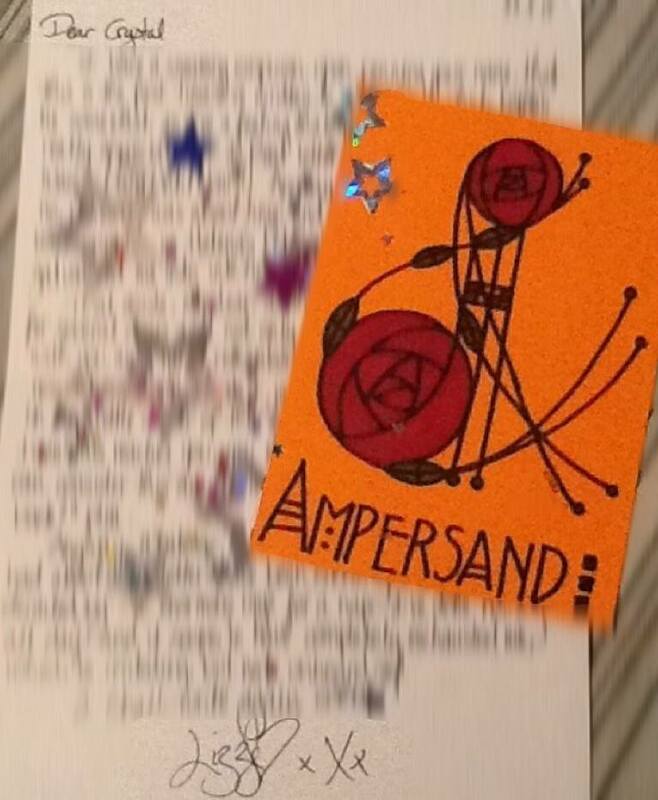 I have an affinity for ampersands and my faraway friend took the time to create something so personal for me, I was overcome by the thoughtfulness of it. More tears fell as I read the words she took the time to sit and write to me. We’ve shared conversations online and in emails, but this was so much more . . . it was real and personal and I could hold it in my hands. There is something so magical about that. So intimate. So real. The letter from my sweet blog-sister Lizzi was the catalyst that sparked my resolve to pull myself up and find it within myself to take back the control I’d relinquished. I don’t even know how to say thank you for that. The shadow dissipated on the 19th day and I slowly began to integrate myself back into my family. They welcomed me with open arms, several loads of laundry and a lengthy grocery list. I was tempted to lose myself in another book, but, you can only hide from reality for so long and since they had to fend for themselves for what they seem to think was an eternity, I relented to resuming my duties as wife and mother, caretaker to all. I did a lot of thinking these past few weeks, I thought of things I was afraid of, things I was thankful for, things that made me sad, and things that made me happy. I thought of the many challenges and hardships in my life and I thought about the many blessings I’ve been bestowed. I thought quite a bit about my failures, real and perceived, but I also thought about my successes and decided maybe I should give myself credit for them. I’ve been focused on the parts of me that feel weak instead of magnifying the strengths I know, without a doubt, I possess. I have a lot more thinking to do and many more books to read, but I think I can manage to do those things without shutting myself off from everyone around me . . . I’m keeping my bubble close by though, just in case. What a wonderful gift to have such a friend!! So glad it helped you!! Oh that Lizzi!! God bless that beautiful gift that she is and all her generous and thoughtful surprises she sends to such wonderful people like you. RIGHT when you need it most. I’m sorry you have had that dive into the isolated abyss… I too, go ‘there’ sometimes and just recently spent a few days much like you- void of anything inspiring and quite defeated, depressed, discouraged and exhausted. I layed low…. not wanting to engage or write or do much of anything but the mandatory ‘caring’ for my family and me. So glad the sun is shining again, April. Blessings to you, Lizzi, and the pages that helped you turn the corner. Your book list is amazing. Several on there are among my favorite ever! Glad you are back in the sunshine, my friend. Sorry you had such a difficult period of days there, but glad books were soothing to you. That letter you received sounds beautiful. Such a sweet gesture.